I’ve been away on vacation, so it’s been a while since I’ve posted a recipe. Since I’ve returned to Boston, we’ve been having a bit of a heat wave, so I thought a quick and convenient avocado club sandwich would be ideal for today. I love this sandwich because it makes an easy lunch or dinner, but it tastes like something from a fancy café. It’s unique and really scrumptious, with a tasty combo of creamy avocado and crispy bacon. Plus Italian-flavored toasted bread, creamy pesto, and a slightly sweet sun-dried tomato and honey compote. And here’s what I’ve been up to while I’ve been away. I took way too many photos of my trip, of course, so I’ll try to post a few of my favorites in each of the next several posts. This photo was taken at sunset in Stanley Park in Vancouver, Canada. My husband Chris and I were having lunch in this park when the waiter told us he’d seen some of the most beautiful sunsets from the windows of the restaurant overlooking the park and the waterfront beyond. So we went back to the same location at sunset to check it our for ourselves. And it was breathtaking – – of course, my photos don’t begin to capture the true spectacle. This is what I loved so much about Vancouver – – it’s a huge city, but it has numerous gorgeous and expansive gardens and parks. Unlike most cities I’ve visited, which have huge highways and industrial buildings along their waterfront, Vancouver preserved the natural beauty of the area by designating about 1,000 acres of green space surrounding the coast as a public park and historic site. And it is very scenic, indeed! Here are all the ingredients you’ll need to make the sandwich. Preparing all the components of this sandwich from scratch would require way more time than I’m willing to put into a sandwich. So I use prepared basil pesto and canned roasted bell peppers for this recipe. Begin by mincing up a bit of garlic. Place a clove on a cutting board, arrange your knife flat over it, and really press down on the clove, smashing it up. Remove the skin and run your knife through the clove in every direction, until it’s very thoroughly minced. Then, arrange some slices of whole wheat bread on a baking sheet so that no two are overlapping. Use a basting brush to brush some olive oil all over the top of each piece of bread. Then use a table knife to spread a bit of the minced garlic over each slice. Place the baking sheet under the broiler and toast until the bread is crisp and golden. Then adjust the oven heat to 400 degrees F.
Transfer the bread to a plate or cutting board to cool, and place a wire cooling rack on the baking sheet. Then grab some center cut, low sodium bacon and arrange the strips on the wire rack so that no two pieces are overlapping. Cook the bacon until small bubbles form and the bacon begins to brown and crisp. Carefully remove the baking sheet from the oven, taking care not to splatter any bacon grease. Meanwhile, prepare the Creamy Pesto. I used a canned, prepared basil pesto for this recipe to save a few steps. Add the basil pesto and the horseradish to a bowl and stir until well combined. Also prepare the Sun-Dried Tomato Compote. Grab some sun-dried tomatoes and add them to a food processor or blender. Then add a bit of water and some honey. Pulse until a thick jelly is formed. Stir the mixture, making sure all the honey is well combined, then pulse again. Grab one slice of toasted bread and spread a layer of the Sun-Dried Tomato Compote all over the plain side of the bread (the side without olive oil and garlic). Top with plenty of baby arugula, a few slices of avocado, several strips of roasted bell peppers, and a couple of slices of bacon. Grab a second slice of bread and spread a layer of the Creamy Pesto all over the plain side to top off the sandwich. Serve it with a salad for an easy and filling meal (I just use the rest of the arugula and roasted bell pepper strips to make a salad, topped with a balsamic vinaigrette). The sandwich is very filling with two slices of bread (and that’s what the recipe below calls for). But this is Chris’s sandwich: a double-decker. With plenty of creamy avocado and crispy bacon, you know it has to be tasty. But, with the variety of healthy ingredients like arugula and red bell pepper, this also happens to be a very high-nutrition sandwich. This recipe is packed with lots of Vitamins A and C, and it’s also very high in fiber, iron, and even calcium! Arrange the slices of bread on a baking sheet so that no two are overlapping. Use a basting brush to brush some olive oil all over the top of each piece of bread. Then use a table knife to spread a bit of minced garlic over each slice. Place the baking sheet under the broiler and toast until bread is crisp and golden, about 4-6 minutes. Adjust the oven heat to 400 degrees F.
Transfer the bread to a plate or cutting board to cool, then place a wire cooling rack on the baking sheet. 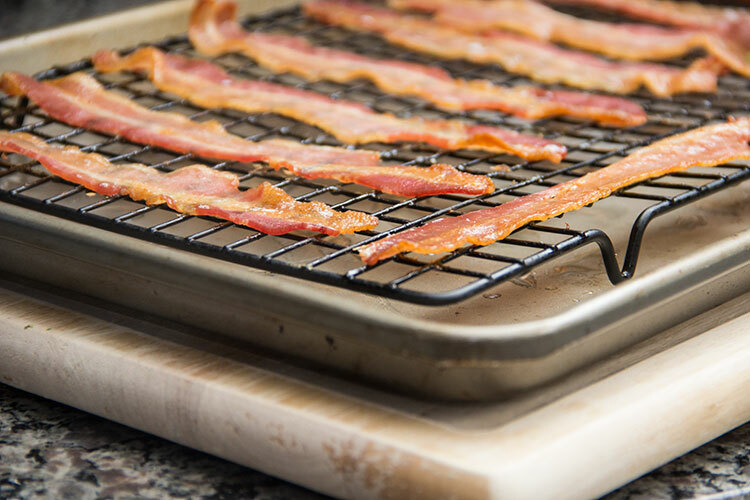 Arrange the bacon strips on the wire rack so that no two pieces are overlapping. Cook the bacon about 8-10 minutes, or until small bubbles form and the bacon begins to brown and crisp. Carefully remove the baking sheet from the oven, taking care not to splatter any bacon grease. Meanwhile, prepare the Creamy Pesto: add the basil pesto and the horseradish to a bowl and stir until well combined. Also prepare the Sun-Dried Tomato Compote: to a food processor or blender, add the sun-dried tomatoes, water, and honey. Pulse until a thick jelly is formed. Stir the mixture, ensuring all the honey is well combined with the mixture, then pulse again. Grab one slice of bread and spread a layer of the Sun-Dried Tomato Compote all over the plain side of the bread (the side without olive oil and garlic). Top with a layer of baby arugula, 3-4 slices of avocado, 4-5 strips of roasted bell peppers, and 2 slices of bacon. Grab a second slice of bread and spread a layer of the Creamy Pesto all over the plain side to top off the sandwich. Hi Jen – Looks like you had fun in Vancouver! It’s such a beautiful area. That sandwich looks yummy – my son will have a feast with this one. He’s a big sandwich eater and loves avocado and bacon. The addition of the pesto and the sundried tomato compote sounds deelish. Thanks for the recipe. Yum, this sandwich looks incredible! I looove avocado! Nothing beats a good sandwich. And this is my favorite way to cook bacon! Vancouver is a very beautiful city – glad to hear you had a lovely vacation! Love like a beautiful vacation! Pesto and sundried tomatoes is one of my favorite combinations to add to sandwiches and pasta! Jen, Vancouver was my number one city until I met Chicago … we had a bit of a rocky reunion last year when I was over, but it was all sorted out and it’s a truly fantastic city .. only that I think the skyliners are so boring- the look all the same, but after Chicago anything will be boring. The English Bay has the most stunning sunsets in the world. This I call a serious sandwich and something I would love to put my teeth into – this is a Wivi style of sandwich. Love the thought of having horseradish in the pesto. Beautiful photos …. specially the sandwich one. This will be bookmarked. Whoooaaa, every single one of these ingredients are totally up my alley! This sandwich looks amazing, and your vay cay pictures are goooorgeous! So glad you had a great time! With the pesto and sun-dried tomato compote, this looks like a must try!